Earned media is the new PR. It’s not only just an organic by-product of your social media or content marketing strategy. Earned media isn’t a media entity in terms of being a set collective communication outlets or tools used to store and deliver information or data. Nor does earned media meet the 15 characteristics of a media entity. Instead of screaming ME, ME, ME, earned media gets someone else to mention you or your business on one or more media platforms. As a result, you gain greater recognition since you’re exposed to other people’s audiences. Many marketers, PR executives and business leaders mistakenly think earned media is “free” visibility and promotion. They believe this because they don’t directly pay to create the content or support it with advertising. Earned media costs are indirect, but they are real. 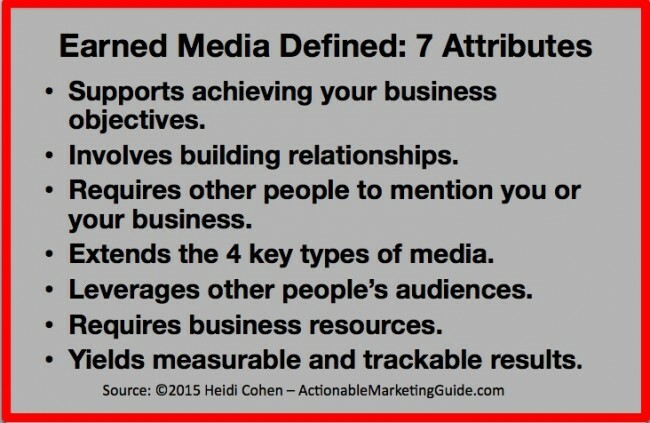 For marketing and PR purposes, earned media is defined by the following 7 key attributes. Brand building. This is particularly important for new businesses where no one knows who you are. Increased traffic. Encourage readers to go to your website or blog. If that’s not possible, get them to sign up for your newsletter. Thought leadership. Get the name of your company out so that people recognize it. Remember that people need to hear something at least 5-7 times before the believe it. For earned media to be effective, you or your PR firm must develop connections with content creators (often journalists), influencers, customers and social media followers. When you’ve built these associations, these people will mention, like, share or comment on you or your business. With increased use of social media, you no longer need to have a direct relationship with journalists or influencers, your customers and social media followers may share or comment on your content and broaden your reach, especially since the average social media participant has 150 connections, the Dunbar number. 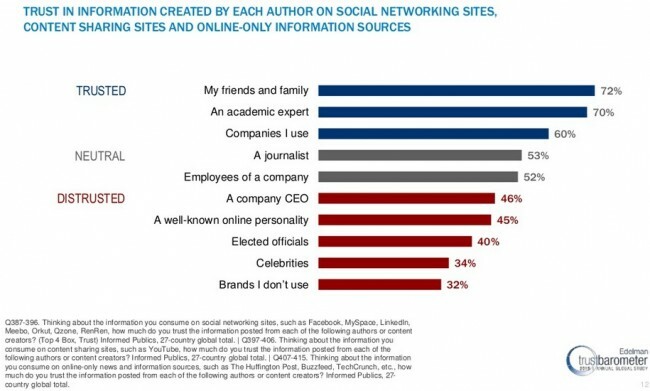 The top of the customer trust list are family and friends, an academic expert, companies I use and a journalist. Earned media augments each of the 4 key types of media including owned media, social media, third party media and curated media. Get influencers to contribute to articles you publish on your owned media. Round up posts are a great way to get influencers to provide content for your site. It’s fitting that I use the definition of PR. Be mentioned by someone else on their social media profile. I appeared in the 8th second of the Social Media Marketing World 2015 (aka #SMMW15) event video. (How cool is that?) It was posted on the event’s Facebook page. Place a guest post on third party media. Write for other media entities and blogs. 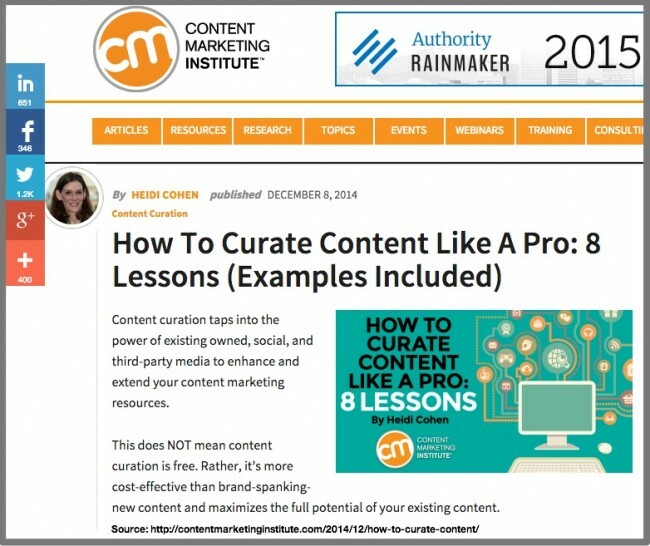 Here’s a post I wrote on content curation for Content Marketing Institute. Get a third party blog or media site to publish your article. This is guest blogging. It was tactic followed by Leo Widrich who built the initial traffic on Buffer through a guest blogging strategy. Encourage visitors to share your content. Use social sharing buttons to highlight what you want them to do. Think offline. Don’t limit yourself to online media outlets. Consider traditional media such as television, radio and live events. At a minimum, earned media requires human resources. Smaller businesses and solopreneurs often substitute their time and efforts for financial resources to create content, compensate PR and advertising agencies, and pay for supporting advertising and distribution. Don’t assume that encouraging people to mention you or your firm is sufficient to maximize your reach. Increase your earned media results by sharing content that mentions you or your firm across your owned and social media platforms. In every Actionable Marketing Guide email newsletter, I spotlight my guest posts on third party media and content where I’m mentioned or quoted. Additionally, I share this content on my social media profiles. 7. Yields measurable and trackable results. Mentions in third party media. Marketers often use impressions from the articles appearing in different publications. Publication of your articles on third party blogs and websites. This is known as article placement and/or guest blogging. It’s a valuable form of earned media since it not only exposes you to an established audience that’s generally larger than your, but also gives you an unstated endorsement from the media site. Presentations at other people’s webinars, events and conferences. Getting a speaking slot at a trade show gets you a lot of visibility especially if the conference promotes it highly. Your company executive also has the opportunity to meet with the audience, at least for live events and is often part of the advertising. Social media likes, shares and comments. While most comment on social networks, these social shares can occur on any of the 4 key media types. Also, don’t underestimate the value of email exchanges that can occur via your share buttons or being copied into an email client. Search results. 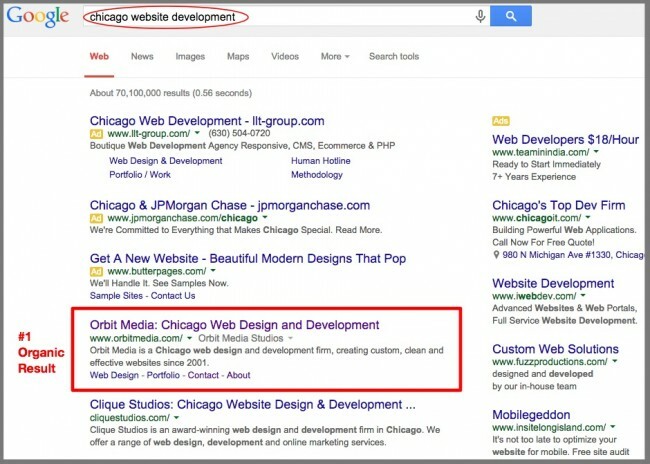 Earned media supports your search optimization tactics. For your guest blogging, make sure that you get 1 link back to your blog. Word of mouth. Get people to talk about what you’re doing, it’s credible. The word of mouth marketplace is worth $6 trillion according to KellerFay research. Of this, two-thirds of the word of mouth impact occurs offline. 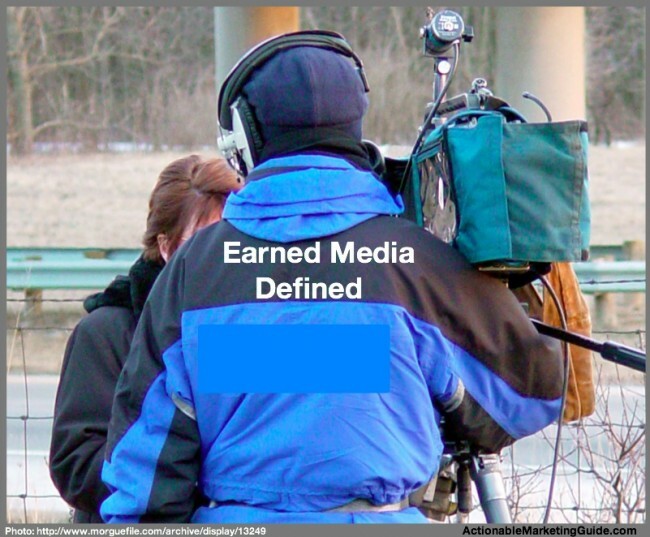 BTW, here’s how 38 marketing experts expressed their earned media definition. While earned media isn’t a media entity in the traditional sense, it should be an integral element of your marketing and PR plans to maximize the results. It leverages the power of other people’s endorsements. 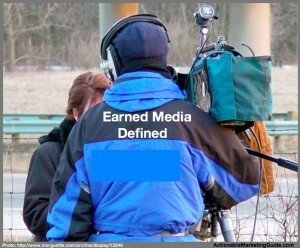 How would you define earned media and how have you used it in your marketing and PR? P.S. This article is dedicated to one of my favorite PR professionals, Gini Dietrich. Tags #SMMW15, Content Marketing Institute, Earned Media, Orbit Media, Social Media Marketing World. Bookmark the permalink. ← 2015 Social Media Benchmarks: Can You Guess The Results? Curious how do you take 2 stores with 2 employees left the governments taken all of our money given us no charges kept all our computers dvr’s and on top of that we have video where police steal stack of money out of our safe. How do you keep going then to top it off we were barely getting by when with in 8 miles of one location 4 more shops have opened? Because i dont want to do any more. is there anything in the article that will actually help us. cause i’m tired. 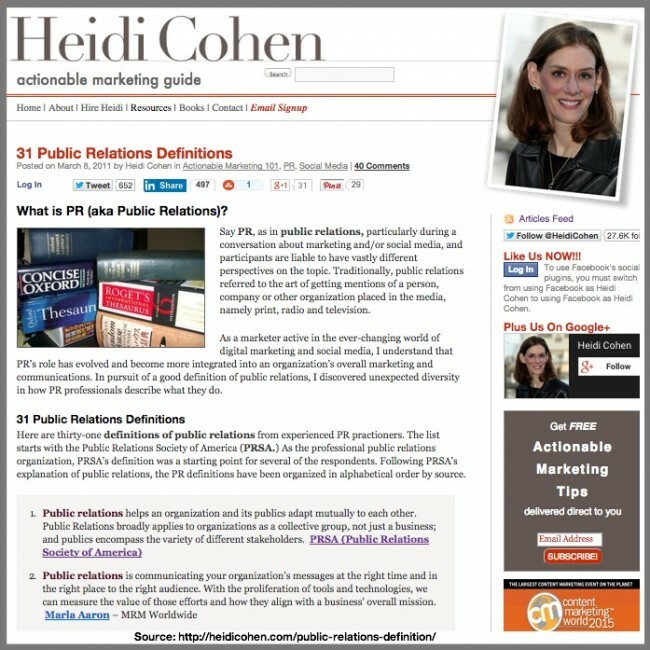 Excellent article Heidi: very clear and concise, with lots of valuable concepts explained. You should turn this into an eBook and/or Infographic.